What advantages and disadvantages does amateur microscopy have? the possibility to do the hobby when there is not much time. Turning the microscope on to observe a few specimens can be done quickly and you do not need to go anywhere with your car. the possibility to take the hobby along as you go traveling (using portable microscopes), if you are interested in natural observation of the country you visit. I have never done that but know of a few people who do this. I would worry too much about the scope becoming damaged. you have the possibility to specialize and to become an expert in a specific branch of light microscopy. You are not dependent on others to do the hobby. If you want to play a competitive sport, then you have to agree on an appointment to meet each other. In my view, there are not many disadvantages. If you enjoy what you are doing, then you do not place a strong emphasis on disadvantages. Here is a list of possible drawbacks. Microscopy can be a solitary activity, as microscopy clubs are not very common. You may have to network over the WWW with other interested people. Some people need external motivation and need to talk to others in order to stay interested. Beginners may have problems choosing the right equipment if they have no microscope dealer around who helps them. Shopping for a microscope is not like shopping for a TV set. THe images produced by compound micrsocopes are sometimes a bit abstract. You will see interesting patterns and shapes, but you might not be aware of their significance, unless you have a basic biological understanding. You might see regular circular structures with a dot in the middle, but might not be aware that you are seeing cells with their nucleus. You must therefore be prepared to read up a little. There are few possibilities for amateurs to contribute to increasing scientific knowledge. Amateur astronomers are able to make discoveries to which they can have their name attached. An advanced amateur astronomer who discovers a new comet, for example, will have the comet named after him/her. THese possibilities do not exist in the field of microscopy because there are no quick ways in which to confirm a new discovery. While there are certainly many things to discover in nature (most species have not been discovered yet), microscopy alone is rarely enough to justify the description of a new species. Genetic studies must also be done and the biological knowledge required, equipment and literature access is beyond the reach of many amateurs. The quest for new discoveries also has a competitive nature, which is almost missing entirely in amateur microscopy, but which might be an important motivating factor for some people. There are many possibilities in trying to improve the microscope. 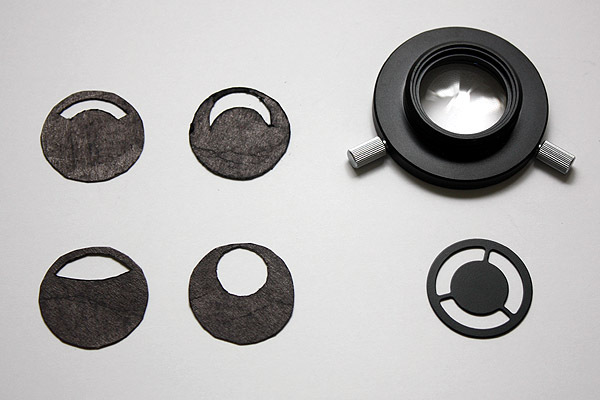 Here is a selection of home-made filters. What are the differences between amateur, enthusiast, citizen, recreational and hobby microscopy? Besides observing, what are some additional tasks for hobby microsopy?